You are at:Home»Living»The Top 20 Best Ride On Construction Toys For Kids In 2017! 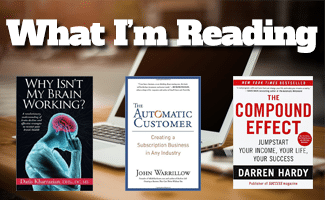 Everyone goes through a stage of infatuation with something and whether it’s trains, planes, cars, or construction, there’s a toy for that. Today, there are dozens of ride on construction toys available for would-be buliders, allowing kids to immerse themselves in a world of building, moving, and digging. With dozens of options including tractors, excavators, diggers, forklifts, and bulldozers available, the only thing standing in their way is finding the right toy. Ride on toys are a fun and engaging way to get kids to play and to use their imaginations, and you can choose between battery operated and pedal powered options to encourage little ones to play, exercise, and have a blast at their imaginary construction site. Ride-ons also help with balance, motor skills, and physical development, as many require kids to use their arms and legs to move around and operate the machinery. 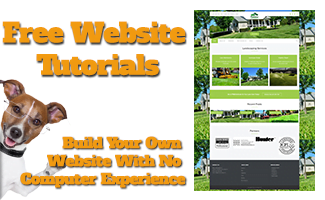 If you’re looking for a ride on construction toy, these top 20 best options are sure to keep your builder entertained for a long time to come. Playing in the dirt is one of the most exciting things most kids can do and with this Kettler CAT Ride on Digger, you can give them the tools to turn their hobby into a temporary profession. 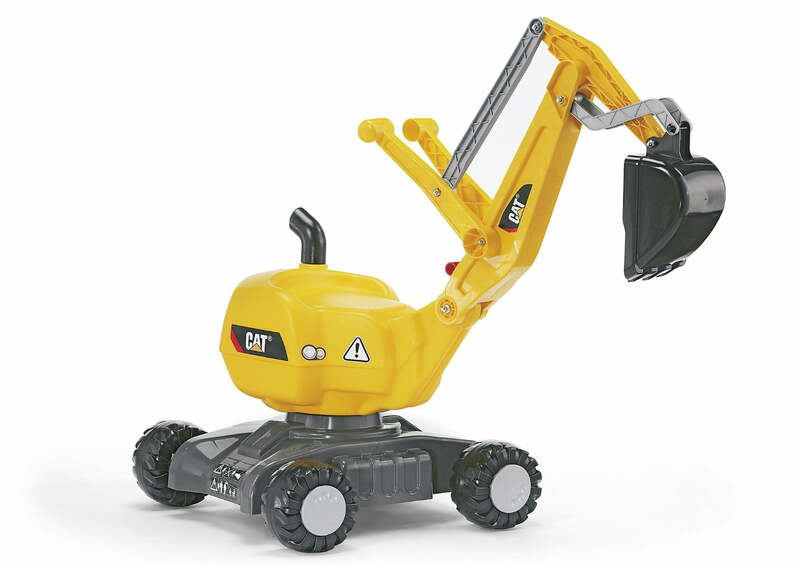 This molded resin digger features a 360-degree swivel body and working bucket with two levers. Two-handed operation and dummy hydraulics offer young diggers a realistic and engaging experience that looks just like operating the real excavator. And for explorers, four large resin wheels with traction strips ensure that your little one can ride their digger anywhere they can walk, including on gravel, dirt, and grass. Why It’s Great: At just 7 lbs this ride on digger / excavator is easy to pick up, store, and transport to play with just about anywhere. Kids will have a blast digging at the sand pit using the working backhoe, and you can easily pick it up and put it away when they’re done. 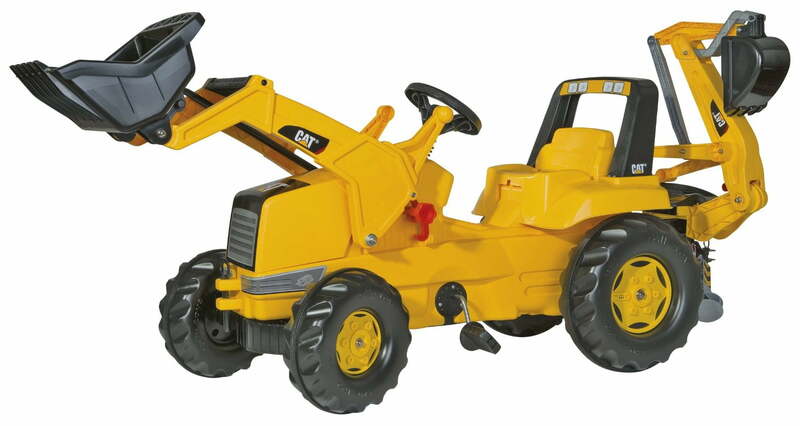 With no motorized parts, this digger is durable and safe even for the youngest users. To the little builder in your home, this Rolly Toys JCB Front Loader with Backhoe Excavator could be the greatest thing ever. 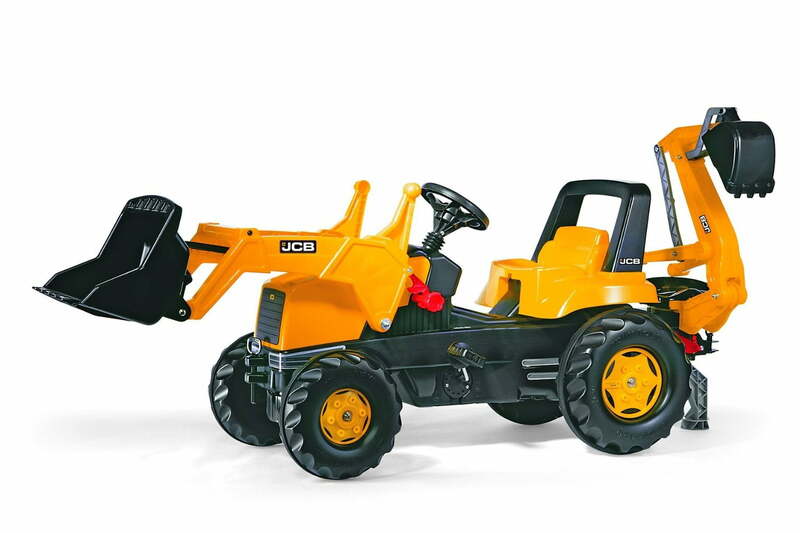 The ride on backhoe features a realistic design with authentic JCB paint and logos, pedal power to ensure your kiddie gets some exercise while playing at construction, and two working buckets so he or she can dig, load, and cart dirt, sand, and toys just about anywhere. The high-impact blow molded resin body offers durability and lightweight construction, so it is easy for even tiny legs to push and pedal around. Oversized wheels complete with rubber traction strips plus a large chain system for easy-pedaling make the ride on tractor suitable for grass, pavement, gravel, and other surfaces. The backhoe and the front loader are manually operated with levers to raise, lower, scoop, and tip so kids can use them to dig holes in sand, dirt, and other soft materials. Why It’s Great: A large size and high weight limit with an adjustable seat ensures that this ride on backhoe is going to be usable as long as your kids are interested. Plus, with front and back hitches, you can add on accessories including plows and trailers. Almost everyone loves a good dumper and this front loading Dexton Pedal Tractor with Dumper is a great toy for builders aged 3-6 years. The ride on dumper features a resin body with an enclosed chain for safety, so little ones don’t have to worry about catching fingers or clothing in the chain. Explorers can go outdoors to pedal around on grass, dirt, pavement, and gravel without losing traction thanks to the oversized rubber tires with a traction strip. The bucket is lever operated, allowing kids to dump their loads of sticks, leaves, grass, books, or just about anything else using a single mechanism right from the seat. Construction enthusiasts will also be pleased with front and rear hitches, compatible with trailers, plows, winches, and other add-ons available for ride on toys. Kids will also adore the working horn sound to add to the realism of playtime. Why It’s Great: The Dexton Pedal Tractor offers ease of use, safety, and fun. Additional features and add-ons mean that the toy can be adjusted to be more interesting as kids get older, and the adjustable seat allows you to change it up for shorter or longer legs. For kids who love to dig and move, the Kettler CAT Front Loader and Backhoe offers versatility and multiple functions. A fully working front loader and backhoe allow kids to scoop, tilt, dump, and lower/raise the bucket to pick up dirt, sand, leaves, or toys and books indoors. Front and back hitches mean that you can upgrade later with add-ons like trailers, snow plows, winches, and other Kettler accessories. The tractor is fully pedal powered, allowing kids aged 3-6 to get some exercise while they pedal around on dirt, grass, gravel, pavement, or indoors. Safety features including an enclosed chain, a roll bar to protect riders in case of tipping, and a stabilizer foot to prevent tipping while digging ensure that young riders will be safe while they dig and move around. With safety features, multiple available accessories, and two digging and moving tools, the Kettler CAT Front Loader and Backhoe Ride on Tractor is a great fit for all ages, and perfect for aspiring young builders. 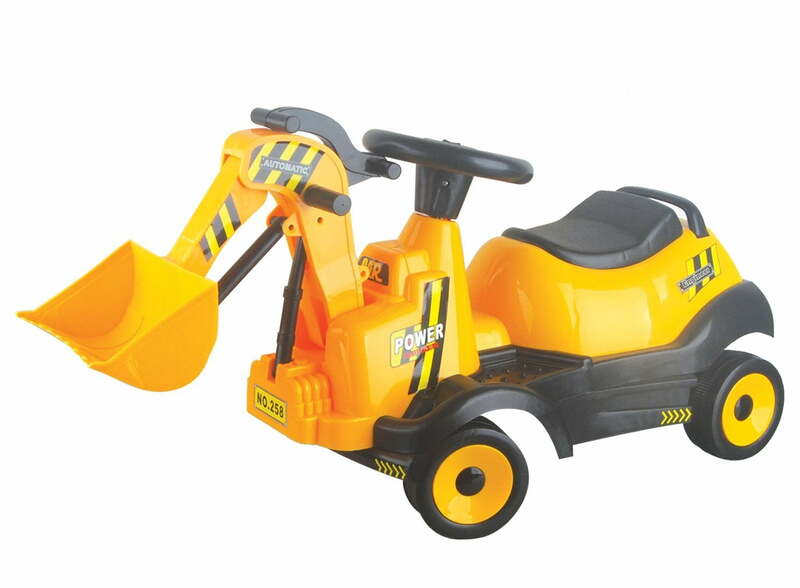 Get your little one excited about digging with this Vroom 6-Wheel excavator. 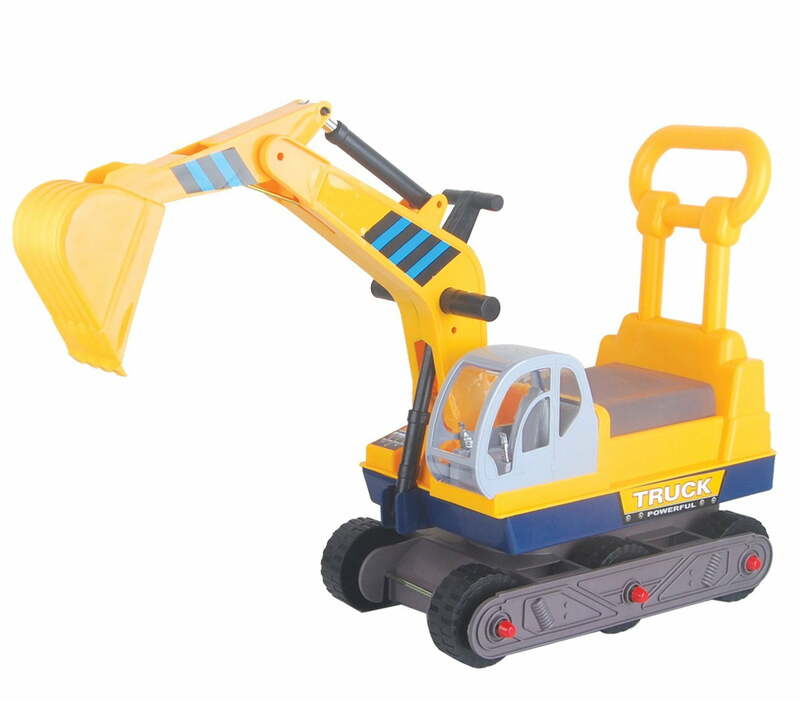 This eco-friendly plastic ride on excavator features a working bucket with mock hydraulics capable of picking up soft sand and dirt as well as toys and other objects, so kids can engage their minds while having fun with construction. The ride on toy does not feature batteries or pedals, and must be pushed or walked forward, making it ideal for young learners who haven’t yet mastered pedals and who might not be okay with a battery powered ride on. The Vroom ride on excavator also features back support to make balance easier for smaller builders, so they can learn to ride and around and steer without falling off. 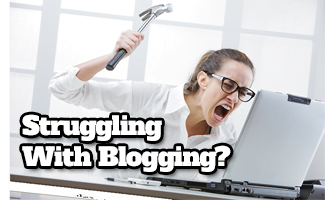 Plus, in case they need help, it’s the perfect place to give them a push. 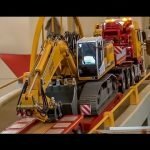 Why It’s Great: This ride on excavator is a perfect starter toy for construction fanatics who need something a little safer. Back support, no batteries or pedals, and the ability to walk and steer the excavator make it a perfect fit for kids as young as 2, but with a maximum weight load of 66 pounds, this digger will grow with your toddler. 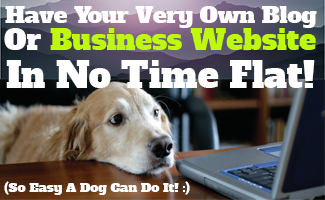 And, at just 7.27 pounds total, it’s easy for you to pick up, store, and transport to parks and playdates. 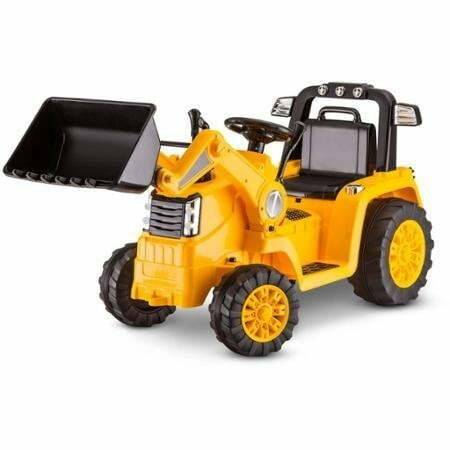 Kids love digging and this Vroom Ride On 4 Wheel Excavator Bulldozer is great for pretend digging and excavation indoors. With a 6-volt battery and a max speed of 1.55 miles per hour, it’s perfect for use in play rooms and on paved sidewalks or packed dirt, where kids can play unobstructed. The manually operated bucket extends forward and out, allowing kids to scoop up and carry dirt, sand, toys, and other lightweight objects. Easy to operate controls with a “Forward” “Go” and “Backward” button ensure that this ride-on is simple, even for kids as young as 2 who need things to be as easy as possible. The digger also features built-in music and a horn function, adding to the realism of playtime. 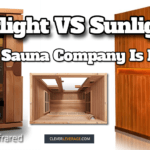 For you, the model is lightweight and at just 15 pounds it is easy to pick up and store. Plus, the rechargeable battery charges overnight at any wall socket and then lasts for hours of play. You’ll also love that it’s made of eco-friendly plastic and better for the environment. Why It’s Great: With a very low top speed of 1.55 miles per hour, this ride on digger is as safe as it comes. The model is great for indoor use, small enough to turn around in most hallways and rooms, and ideal for younger kids who don’t have a lot of room outside but who still want to play at construction. The addition of sound effects including music and the horn also add extra engagement to help little builders imagine. 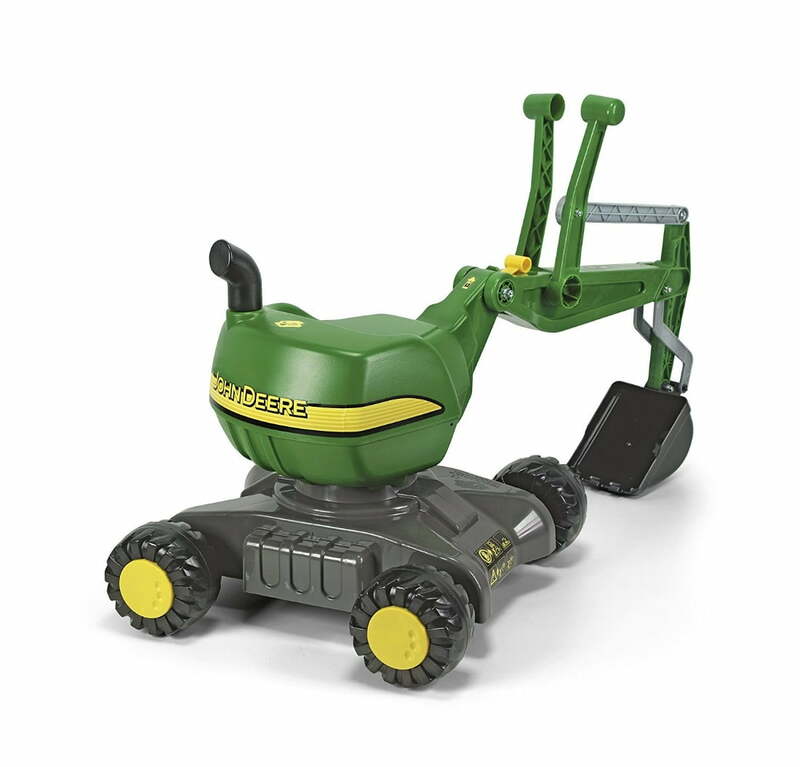 Digging in the yard or the sandbox is a great pastime for kids of all ages and this ride on Rolly Toys John Deere Digger / Excavator is the perfect tool to help. 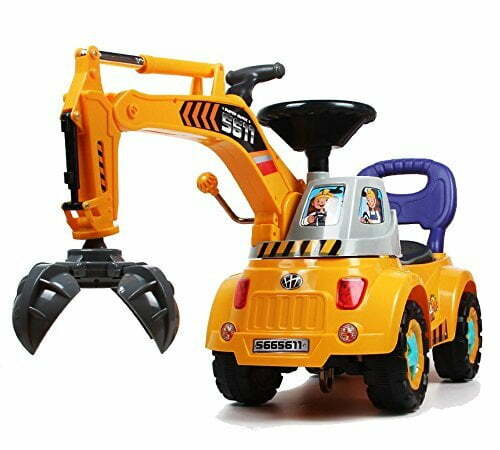 Kids in love with digging and building will love the fully functional excavator, perfect for digging and filling large holes, just like at a real construction site. This ride on excavator is also a fully licensed John Deere product, complete with colors and logos, so it’s perfect for John Deere lovers as well. The digger features a blown resin body with a plastic bucket and dual action levers for lifting, raising, and tipping the bucket. Full 360-degree rotation allow kids to realistically dig, tilt, and dump dirt without moving from their seat. Little explorers can benefit from four large plastic wheels that offer good traction on gravel, dirt, and grass to take them everywhere. You will love the lightweight plastic body and locking arm that ensure it is just as easy to pick up, transport, or store. Why It’s Great: Kids can dig and make holes in the sandbox or in soft-packed dirt to live out their construction dreams. However, the lightweight plastic build and bucket mean that this toy is also safe for indoor use and it’s easy to transport and store. The slightly smaller size makes it easy to use for younger kids and easy for bigger ones to stabilize while digging. Click here for the top 10 best John Deere riding toys for kids. Moving, carting, and lifting objects and dirt are most of the fun of building and this ride on tractor does all of that. The Kettler CAT Ride on Front Loader Tractor and Trailer set features a pedal powered ride on tractor with a fully working front loader and a detachable trailer, so kids can have a blast going through the motions of digging, loading, and carting lightweight objects, toys, dirt, or sand. The ride on tractor is fully pedal powered and features oversized resin tires with rubber traction strips. The tires are suitable for use indoors and out, including on pavement, packed dirt, and cut grass. 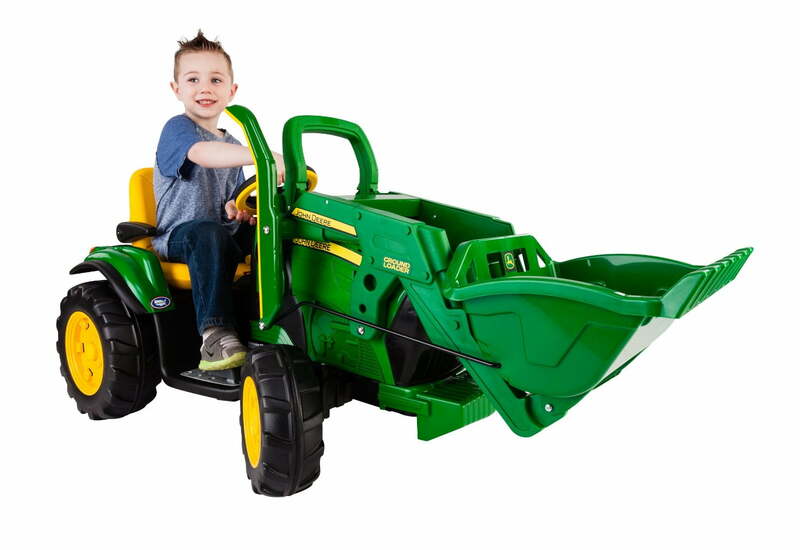 Kids can operate the manual front loader using levers from the driver’s seat, allowing kids to easily scoop, raise, and tilt to dump into the trailer. Importantly, the trailer is plastic and is not rated for heavy weight. Why It’s Great: Kids will love the authenticity with the CAT stickers, the ability to load the trailer, and the combination of loading and hauling. Plus, with features including an adjustable seat, enclosed chain for safety, and pedal power, this model is safe for kids as young as two who want to get started on their dreams of construction. 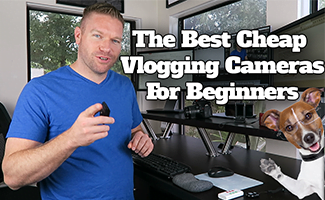 It’s also smaller than many other competitors, so it’s a great fit for younger kids. 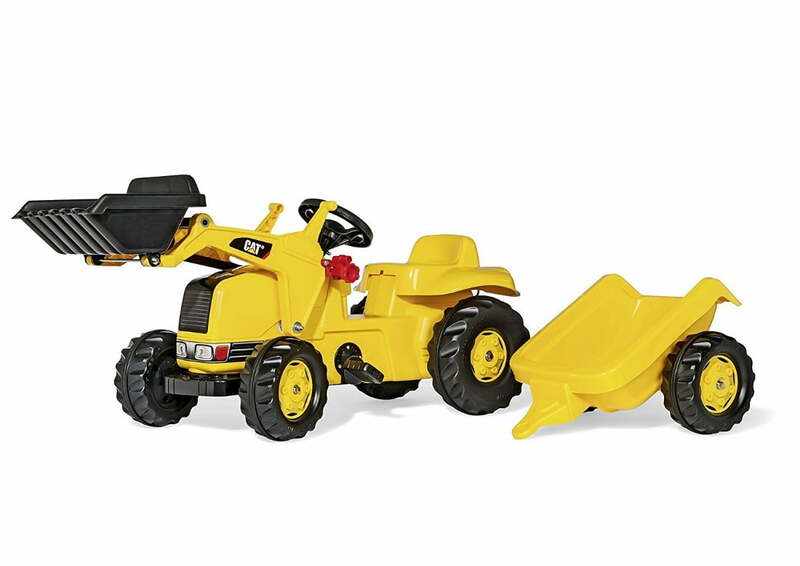 The Kid Trax CAT Ride on Front Loader offers everything a young construction worker needs to get started building and digging. 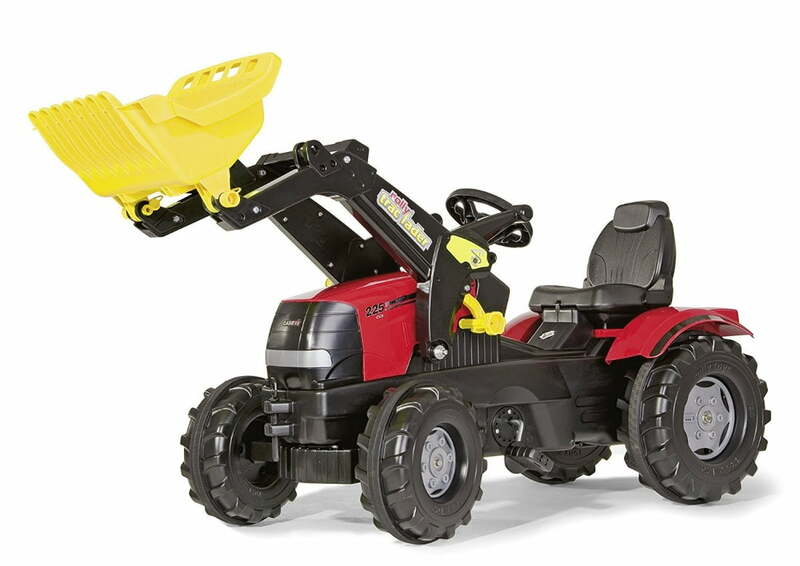 The 6v battery powered ride on front loader features a top speed of 2.5 miles per hour, a manual front loading bucket, reverse, and a realistic ‘gas’ pedal. With no need to pedal, this ride on toy is a good fit for younger kids who don’t yet have the strength to pedal around non-stop and integrates plenty of safety features including a low top speed and an automatic brake when little feet are lifted from the pedal. The Kid Trax tractor features oversized resin wheels with PowerTrax strips for better traction on dirt and grass. However, at just 6 volts, the tractor is mostly suitable for flat surfaces indoors or on pavement. The bucket also does not touch the ground, which prevents young kids from dragging it along but also means that it isn’t suitable for use as a digger. The battery lasts for an average of 2 hours and should be charged overnight using the included wall charger. Why It’s Great: With safety features like an automatic brake, a rechargeable battery, and low top speed, this ride on toy is perfect for use in smaller spaces and by younger children. As a result, it’s a great choice for kids as young as 3 who are just growing into their love of construction. 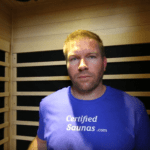 However, with a max weight of 60 lbs, i’s suitable for most kids as old as 6, and will grow with your child’s interest in building. With a fully functioning backhoe and front loader, this Rolly Toys John Deere Ride on Tractor is ideal for enthusiast diggers and kids who just want to cart their toys around. An adjustable seat, stabilizer, and safety latch ensure that this John Deere ride is suitable for kids as young as three, while multiple functions including lift/raise/tip/scoop make it interesting for kids as old as eight. The heavy-duty buckets allow owners to dig in soft sand, gravel, and dirt, while the front loader allows kids to cart dirt to a ‘construction’ site or to fill holes after playing. The John Deere features a resin body with oversized resin wheels and thick rubber tread for traction on most surfaces including grass, dirt, and gravel. 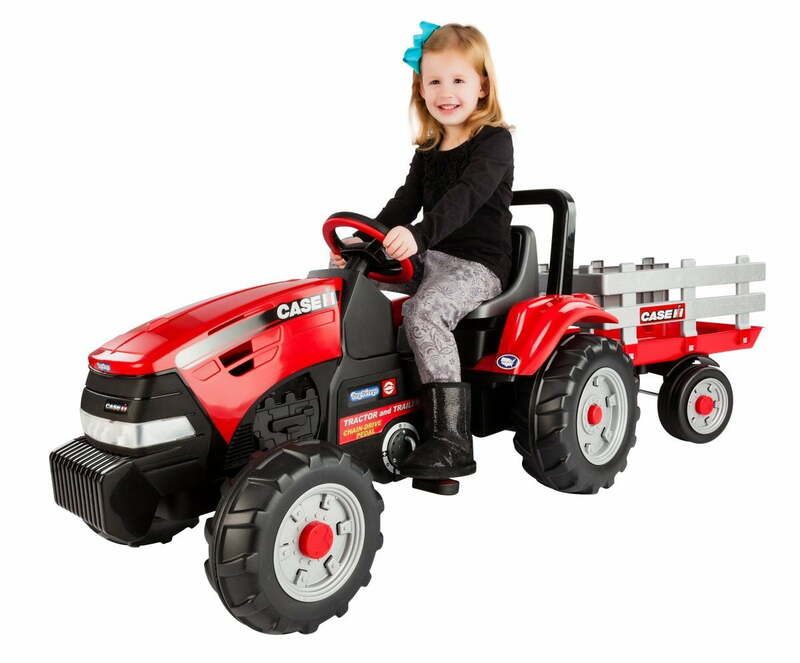 A front-lifting hood compartment adds to the realism so kids can play at fixing and checking their tractor. Kids who want to expand can use the front and back hitches to add a trailer or another Rolly Toys accessory. A strong 12mm rear axle, covered integral chain, non-slip pedals, and a heavy-duty front axle ensure that your kids can ride around for a long time to come. Why It’s Great: A heavy-duty build, adjustable seating, and stabilizer foot ensure that this ride on tractor is safe and comfortable for all ages. Kids love the addition of both the front loader and the backhoe, and you will love that it’s fully pedal powered, great for exercise, and easy to use. Hauling things around is half of the fun for kids who want to build, and this Peg Perego Case IH Ride on Tractor and Trailer allows for just that. The pedal driven ride-on tractor allows kids to get some exercise while they ride around the house, the yard, or the park. It’s also suitable for explorers, because the oversized resin (plastic) wheels feature a thick tread capable of gaining traction on most surfaces including pavement, dirt, and flat grass. 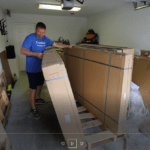 Kids will also love the included Case trailer that connects and disconnects from the hitch on the back, allowing them to haul sticks, toys, or whatever else they care to pick up. The adjustable seat allows you to resize the seating for different sized legs, while the large chain and lightweight plastic body ensure that it is easy to pedal for kids as young as 3. The chain is fully enclosed and safe for even the littlest fingers, so you won’t have to worry about kids playing on their own. Why It’s Great: With an included side stake trailer, this pedal tractor is ideal for both budding enthusiasts and long-term tractor afficiandos. The combination of pedals and adjustable seating make this toy a great alternative to a tricycle for kids in need of transportation around the park or the block. Plus, with a lightweight plastic construction, it’s as easy for you to move as it is for them to pedal. With a full working front loader, this pedal powered ride-on tractor offers versatility and fun for kids who like heavy machinery, rc construction, and tractors. The FarmTrac front loader is suitable for scooping and moving dirt, sand, light toys, and anything else kids want to collect and carry. 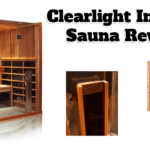 The sturdy high-impact blow molded resin body offers durability and safety, and you will love the adjustable seat, which slides into two positions, so you can fit it to different age groups. The resin tires feature no-slip rubber strips suitable for indoor and outdoor use, so you can take it along to parks and playdates without worrying about whether it will drive on the grass. There’s a certain appeal to getting your hands dirty and actually going out and digging, and kids who love construction will appreciate that. If your kids really love to dig, they’ll be overjoyed with the CAT Steel Digger. While this is not an indoor toy, the ride on digger is tough, durable, and capable of just about anything an aspiring construction worker might want to do. Two manual controls allow kids to fully control the bucket to dig into sand, snow, gravel, dirt, and other soft materials. Unlike almost all its competitors, this digger features a solid high-carbon steel frame, ensuring that it’s not going anywhere anytime soon. Kids will love the realistic steel construction, full 360-degree seat rotation, mock hydraulic spring-assist dual-action levers, and the realistic tread. And, with 8 wheels under heavy rubber all-terrain tread, they can roll anywhere they want, indoors or out. Why It’s Great: The full carbon steel build makes this digger unique because kids can dig as much as they want without worrying about breaking their digger. While it doesn’t feature the same mobility as plastic diggers, it still moves well, features all terrain wheels and tread, and is an all-around versatile digger that will let your kid’s imagination soar. 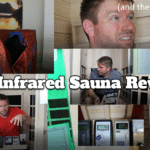 You will love it because it’s tough and you won’t be buying a new one anytime soon. 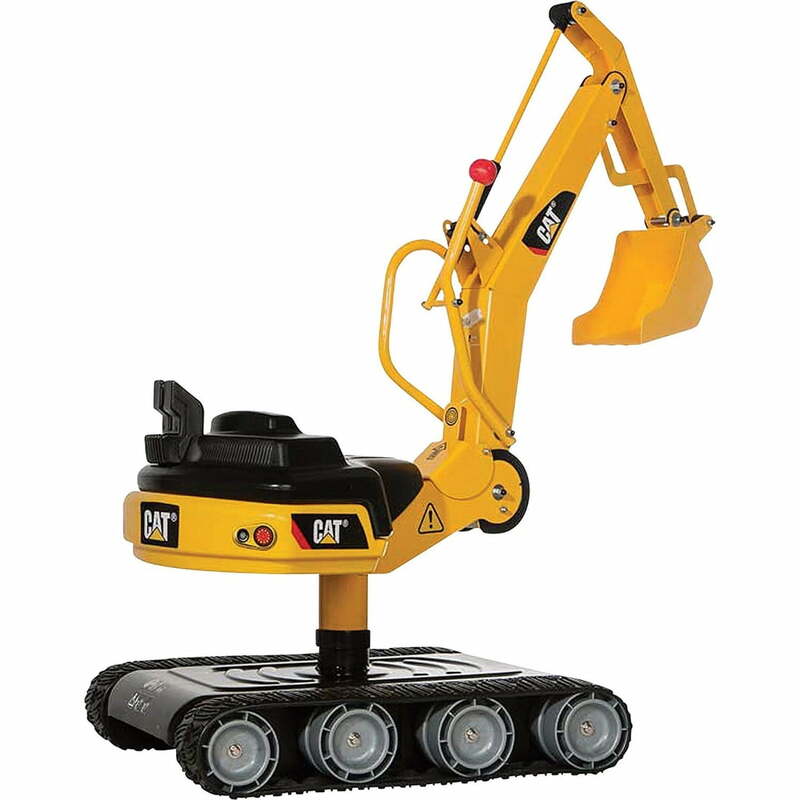 Parents looking for a budget alternative to branded CAT and John Deere diggers and tractors will love the Costzon Battery Powered Front Load Digger. With 2 speeds, a fully operable bucket, forward speed, and a flashing light, this budget ride-on digger has all the features of name brands without the price. The digger features a low speed of 2.5 miles per hour and a high speed of 4.5 miles per hour, plus an integrated seat belt for safety at higher speeds. It’s also simple to use with a small button control in front of the seat, ensuring that even new drivers can stop and start safely without having to worry about using their feet. Kids who want to get to work can use the manually operated tipping front loading bucket, which can be used to move dirt, sand, and other objects. Why It’s Great: For parents, the advantages of the Costzon battery powered Kingdom Front Load Digger are obvious. It’s more affordable than licensed brands, but offers all the bells and whistles, plus the added safety of a seat belt and top facing controls. For the kids, it’s even better with two speeds, a working dumper, and enough functionality to be interesting for a long time into the future. 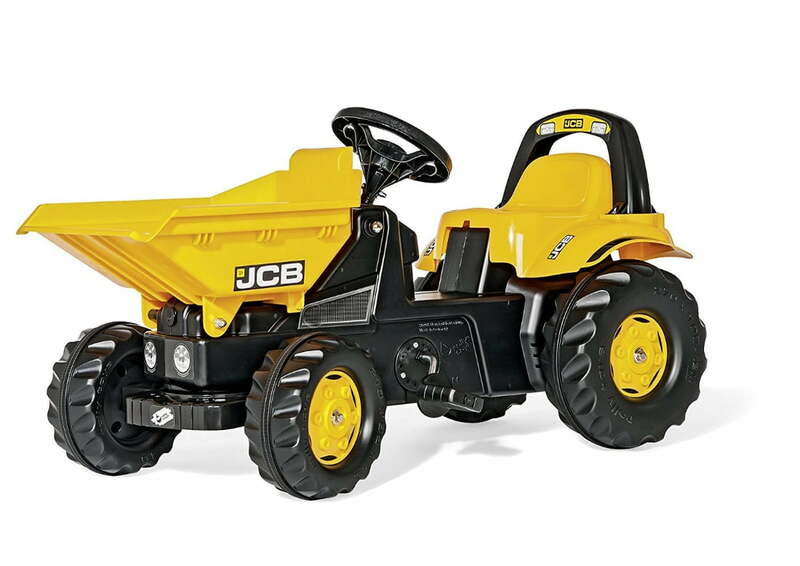 Every child who dreams of building wants to own a dumper or dump truck and this Rolly Toys licensed JCB Dumper Tractor is sure to be a hit. With a fully functional top loading dumper, this ride on tractor is a perfect solution for anyone who loves carrying, carting, or moving just about anything around. The JBC Ride-on Dumper Tractor features a heavy-duty resin body, anti-slip pedals, a 12mm rear axle, covered integral wheel chain drive, and a pedal crank with eccentric bearing and a chain tensioning system. While your little one likely won’t care about any of that, it does mean that the dumper is safe, durable, and ready for work and play just about anywhere. 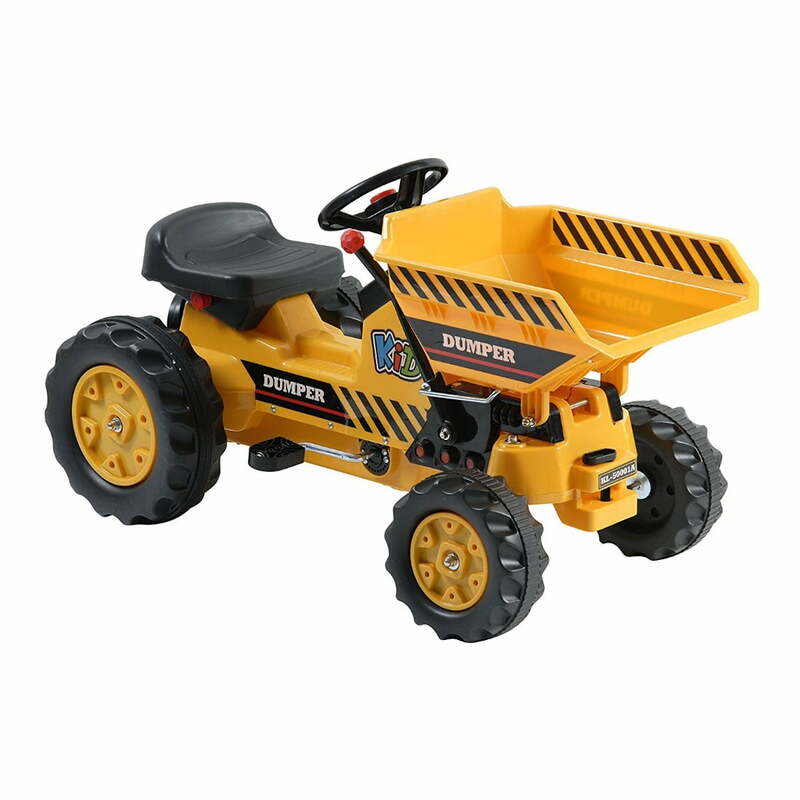 The front dumper is fully working and sturdy enough to carry heavy dirt loads, so it’s a great fit for kids who want to get their hands dirty. Why It’s Great: With a slightly smaller size, this ride-on dumper is great for kids who are just learning to get around but with built-in pedals, will ensure that they get plenty of exercise while they play. However, with no adjustable seating, it’s not suited for kids over five. The oversize wheels and sturdy design make the JBC ride-on dumper an easy choice for indoor/outdoor play, while the chunky chain ensures the whole thing is easy to pedal even for little legs. 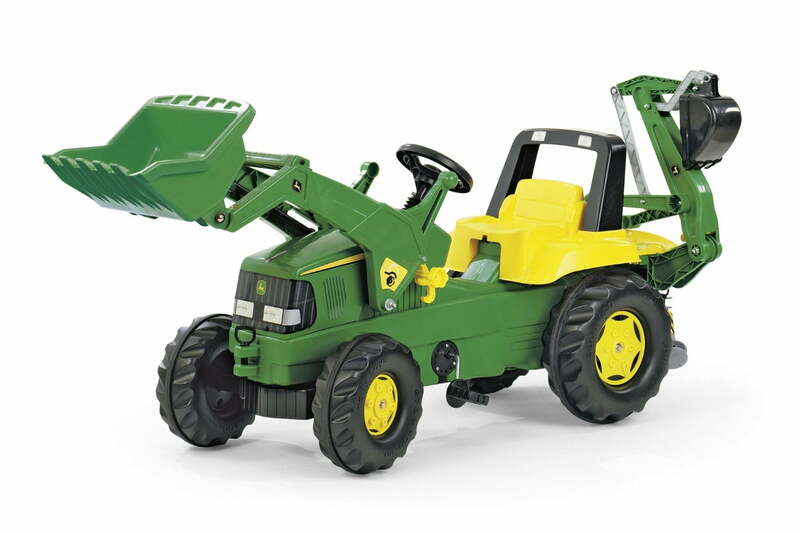 Everyone loves a John Deere and this fully adjustable battery operated front loader is a great fit for the little John Deere fan in your life. The Peg Perego John Deere Ride on Ground Loader features a durable resin body and a variety of fully adjustable features to keep kids playing and entertained. Four-wheel drive and high-traction rubber tread wheels allow this ride-on to drive on most types of terrain, so kids can explore on grass, dirt, gravel, and pavement. The working bucket scoops, raises, lowers, and tips, allowing kids to move and carry everything from toys to sand and leaves to their hearts content. Kids will love the ability to drive at 2.5 or 4.5 miles per hour and reverse, and you will love the ability to lock the tractor to the lower speed for indoor use or for younger drivers. Plus, the accelerator automatically functions as a brake once little feet stop pressing it, so the tractor stops as soon as they pick up their feet. The tractor comes with a 12-volt rechargeable battery and charger. Little ones who don’t yet have the leg power to pedal an excavator around can still enjoy the fun with this battery powered option. The Kize CAT Ride on Excavator Truck features a rechargeable 12v battery with a realistic foot pedal for ‘gas’ allowing would-be construction workers to power their way around at a max speed of 2.5 miles per hour. 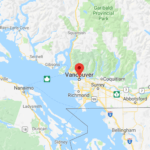 The anti-slip tires mean that the truck is good for use indoors but thick rubber tire tread ensures that it performs just as well on grass and concrete. The manual bucket operates using two levers to raise and lower, so little builders can scoop up sand and other light-weight material. It’s also easy to charge with a plug right under the seat. The rechargeable battery lasts for about 2 hours and can be recharged overnight at any wall socket. Why It’s Great: The battery-operated locomotion and no-slip tires are great for indoor use or perfect for younger kids who have to stay a little bit closer to home. However, the ride on toy also functions well outside, so it is a great, versatile toy. Rechargeable batteries also mean no waste or spending more on batteries, although the average of a 2-hour battery life will limit play time. For more excavator toys, click here. 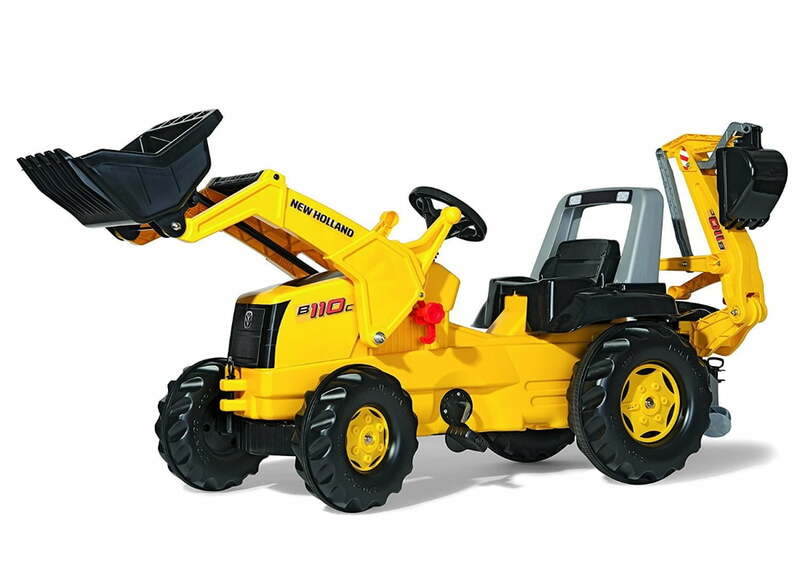 Kids who love construction will adore the multiple features offered by the Rolly Toys New Holland Front Loader and Backhoe Ride-On Digger. The pedal tractor features a working front loader and backhoe with raise, lift, scoop, and tipping mechanisms to pick up, scoop, and move light loads like dirt and sand. 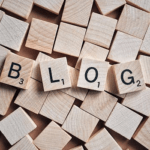 Oversized resin based tires with rubber tread mean that it can be taken outside and will pedal on dirt, sidewalks, and pavement; so it’s great for use in yards and parks. 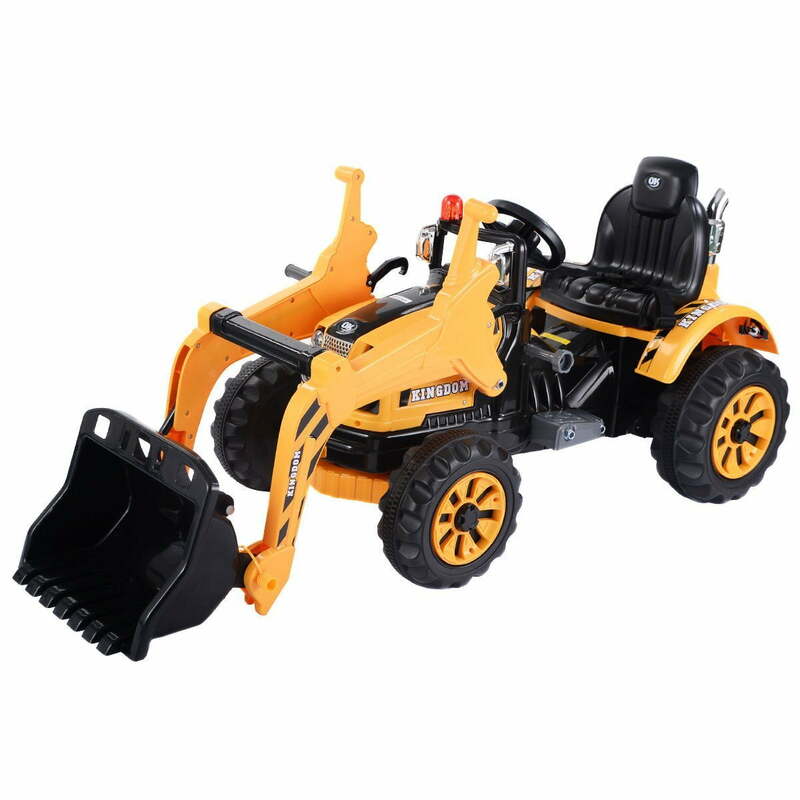 The Rolly Toys ride-on backhoe features a durable design with a high-impact blow-molded resin body, a 12mm rear axle, covered integral fixed wheel chain drive, chain tensioning system pedal crank, front axle with suspension, and anti-slip pedals. It’s also suitable for multiple age groups and the adjustable seat slides into two positions so you can adjust for shorter or longer legs. For little kids in love with engineering but who don’t have a lot of space outdoors, this 3-in-1 grabber is a great choice. The ride on toy offers a manual arm and grabber, suitable for picking up toys and lightweight objects, making cleanup and pretend building a breeze. The ride on toy is suitable for ages 2-5, and includes sound effects like music to help kids stay engaged. 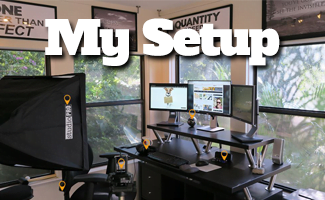 Additional features include a full backrest to provide stability, a storage compartment with beach accessories, and a hook for tying and pulling items. Why It’s Great: With a lightweight build, the ability to pick up objects, and plenty of features, this scooper is a great introduction to engineering and building for little kids. Plus, with no batteries, it’s a great way to get kids to run around and have fun while getting exercise. While not suitable for bigger kids, this grabber is a great ride-on solution if you need something that will work indoors. If you’re looking for a battery powered ride-on toy for kids who like to build but who might need a small boost for their imagination, the Kid Trax CAT Bulldozer has a lot to offer. The ride on bulldozer features a durable plastic body and track with realistic CAT logos and design sure to captivate little bulldozer fans. It comes with a twin power motor capable of a top speed of 2.5 mile per hour, with speed forward and reverse, turn-in-place steering, and diesel motor and construction themed sound effects. 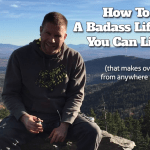 The rechargeable 12V battery features a charge time of 14-18 hours (ideally you can leave it plugged in overnight) and an average run time of 1.5-2 hours depending on how much the sound effects are used. Kids can drive, play with the manual lift and dump bucket, and move around lightweight plastic toys. 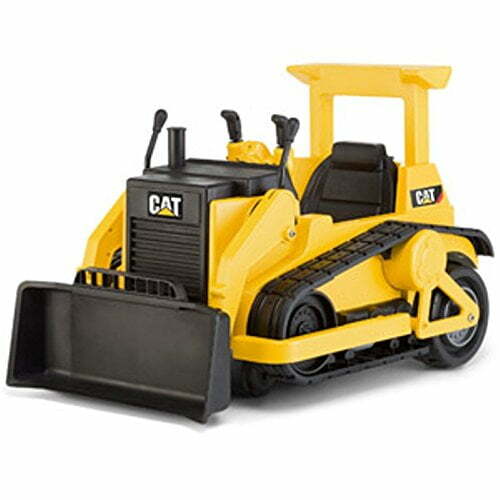 The Bulldozer comes with 1 CAT hard hat and 2 plastic boulders for playtime. Ride on toys provide a unique and engaging experience that’s hard to match for kids in love with building. 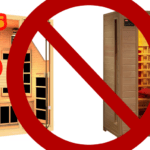 Most of these toys are great for indoor and outdoor use, so you can choose something that’s safe and practical for your area. Plus, with a variety of locomotion options from battery powered to pedal, you’ll rarely have to bend down and push. See this list for the most popular ride on jeeps of the year! Have fun with your new ride-on toy!